Shop CVS Pharmacy, online at cvs.com, for all your pharmacy and drugstore needs. CVS Pharmacy makes it easy order prescription refills anytime and anywhere and have them delivered to your home. 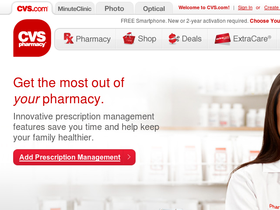 Plus, CVS Pharmacy answers customer questions about medications just like at any CVS location. CVS Pharmacy also offers home health products, fragrances, beauty products, As Seen on TV products, and more from brands Revlon, Sally Hansen, Gucci, Armani, and more at discounted prices. But before you refill your family's prescriptions at home or shop for your beauty or health, get all the latest cvs.com discounts, CVS pharmacy promotions, and CVS pharmacy coupon codes found here at RetailSteal.com. CVS Pharmacy ships within the United States, US territories, and APO/FPO addresses. CVS Pharmacy offers standard and expedited shipping options. See site for more information. Save up to 30% on the current deals happening now at CVS Pharmacy. Shop today and enjoy savings on brands like Drive Medical, Olay, Sally Hansen, and others. Enjoy 25% savings on skin care from CVS Pharmacy. Click link to shop and use coupon code to save. Enjoy free shipping from CVS Pharmacy on your purchase $49+. Click link to shop and save today. Enjoy free standard shipping on prescription purchases from CVS Pharmacy. Click link to shop and save. Save up to 25% on fragrances from CVS Pharmacy. Click link to shop and save on Calvin Klein, Armani, Dolce & Gabbana, White Diamonds, and others. Enjoy savings up to 20% on beauty and cosmetics from CVS Pharmacy - click link to shop and enjoy discounts on L'Oreal, Revlon, Maybelline, John Frieda, and others. Enjoy extra savings from CVS Pharmacy when you sign up for emails. Click here to get started. Shop for diet and nutrition products starting from only $0.99 from CVS Pharmacy. Click here to save.